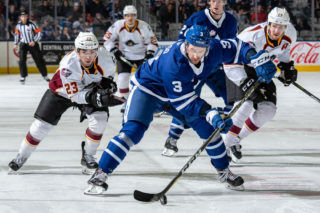 With a 2-1 win over the Utica Comets on Friday night, the Toronto Marlies clinched a postseason berth for the eighth straight season. 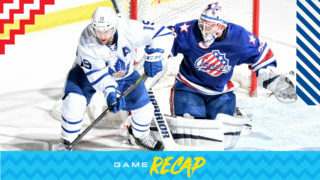 Adam Brooks scored the game winning goal late in the third period to seal the win for the Marlies. The opening period was an even back and forth affair as both teams looked to tilt the ice in their favour. Each goaltender faced eight shots but neither team found the back of the net in the opening 20 minutes. Mason Marchment opened the scoring at 16:43 of the second period, capitalizing on a power play opportunity. Michael Carcone fired the puck on Comets’ goaltender, Michael Leighton who made the initial stop, but the rebound came off his pads and onto the stick of Marchment who was ready and waiting to tap it home. Jordan Subban picked up the secondary assist on the power play goal. The Marlies outshot the Comets 9-6 in the middle frame and held a 1-0 lead on the scoreboard after 40 minutes of play. The Comets solved Kasimir Kaskisuo and evened things up just past the halfway mark of the third period. 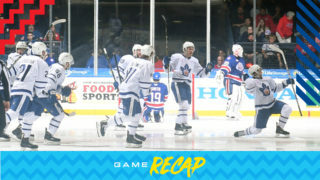 With time winding down and the score locked at 1-1, the Marlies battled to restore their lead. With three minutes to go, Timothy Liljegren was called for tripping, sending the Marlies to the penalty kill. Just over a minute into the Comet’s power play, Nicholas Baptiste was able to corral the puck after it came off Kaskisuo’s pads, before sending Adam Brooks off to the races. Brooks had good jump on the last Comets defender and was able to get the puck to his backhand and shovel it past Leighton to put the Marlies back in front with 1:25 to go. Jordan Subban picked up the secondary assist on Brooks’ game-winning-goal for his second point of the night. The Marlies will close out their three-in-three tomorrow night in Binghamton. Mason Marchment scored on the power play at 16:43 of the second period. Marchment has 24 points (12 goals, 12 assists) in 42 games. This is his second game since returning from 25 games out due to injury. Adam Brooks scored the shorthanded game-winner at 18:35 of the third period. This is Brooks’ fifth game-winning goal of the season. Toronto is 14-2-0-2 when Brooks registers a goal. Michael Carcone recorded the primary assist on Marchment’s second period power play goal. Carcone has 43 points (19 goals, 24 assists) through 60 games this season. Jordan Subban registered the secondary assists on Marchment’s second period power play goal and Brooks’ third period shorthanded game-winner. Subban has 16 points (3 goals, 13 assists) in 45 games this season. Nicholas Baptiste picked up the primary assist on Brooks’ shorthanded goal in the third period. Baptiste has four points (2 goals, 2 assists) in his last six games. Kasimir Kaskisuo stopped 23 of 24 shots he faced. Kaskisuo is now 11-9-3-1 on the season with a .893 Save Percentage and a 3.11 Goals Against Average. 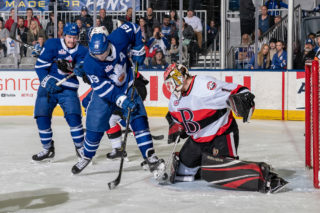 Toronto clinched a spot in the Calder Cup tournament for the eighth straight season and 11th in franchise history with their win tonight combined with the Belleville Senators’ loss. This is Sheldon Keefe’s 300th game as head coach in the AHL. Through his four seasons, he has a record of 188-86-18-8 and 0.669 winning percentage. Toronto is 23-10-4-2 since January 4 and have outscored their opponents 123-107, facing 17 different teams. In 29 of 39 games, Toronto has earned a point (52). Toronto was 6-for-6 for on the penalty kill and was 1-for-4 on the power play. Adam Brooks scored his second and Toronto’s ninth shorthanded goal of the season. Utica had a 24-21 edge in shots in all situations. Michael Carcone led the Marlies with three shots on goal. The Marlies are 26-14-7-3 against North Division opponents and finish the season 4-2-0-0 against the Comets. Toronto has outscored Utica 27-21 through six contests. The Marlies are 13-7-3-1 when tied after the first period and 28-1-2-1 when leading after the second period. Toronto is 18-13-3-2 when outshot by their opponent. The Marlies 11-5-2-2 in Friday games and are 1-1-0-0 in April. Colin Greening (knee) did not dress for tonight’s game. He left Toronto’s game in the third period on March 10 against Bridgeport and did not return. Vincent LoVerde (knee) did not dress for tonight’s game. He left Toronto’s game in the second period against Rochester on March 24 and did not return. April 4: Recalled goaltender Michael Hutchinson from loan by Toronto (NHL). April 4: Reassigned goaltender Eamon McAdam by Toronto (NHL) from Newfoundland (ECHL) to Toronto (AHL). April 1: Signed defenceman Alex Basso to ATO. April 1: Signed goaltender Zachary Bouthillier to ATO. April 1: Signed forward Erik Brown to ATO. April 1: Reassigned forward Semyon Der-Arguchintsev by Toronto (NHL) from Peterborough (OHL). It’s nice to have some certainty to it. We knew we were close but we never took anything for granted. It’s been a challenging season for us in many way and so you just want to make sure you take care of things while you can. In the fashion that we did here today, that two points is a gutsy effort for our guys there in the third period – what a play by Adam Brooks, to seal it for us and give us the goal and then we get some help out of town but the guys did the work we needed to do today and I’m proud of them for doing so. There’s definitely been a lot of adversity this year, lots of twists and turns, lots of ups and downs, lot of people that contributed in a great way to our team that are no longer with us. But whomever we brought in or brought up, guys just found a way. When there was an issue somewhere in our game, somewhere else stepped up and found a way to get points and scratch and claw, today’s win is a good example of that. The players bring a lot of work and deal with a lot and you can see with a lot of teams when they face such adversity, you lose players to injury or whatever it might be, things can get away from you and our group didn’t allow it to happen. Credit to them for doing so and we’re going to give ourselves a week here to help prepare us for the playoffs. We know we’re going to be facing a great challenge but with this group of guys, we’re going to do all we can to prepare and get ready to play. The Marlies are back on the road tonight for a North Division matchup against the Utica Comets. Coming off a tough 3-0 loss at home to the Hershey Bears yesterday, the Marlies will be looking to get back in the win column as they could potentially clinch a playoff berth tonight. 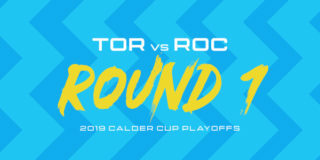 With a win tonight in Utica and a Belleville loss to Hershey, or with an overtime/shootout loss in Utica and a Belleville regulation loss to Hershey, the Marlies could secure their spot in the 2019 Calder Cup playoffs. 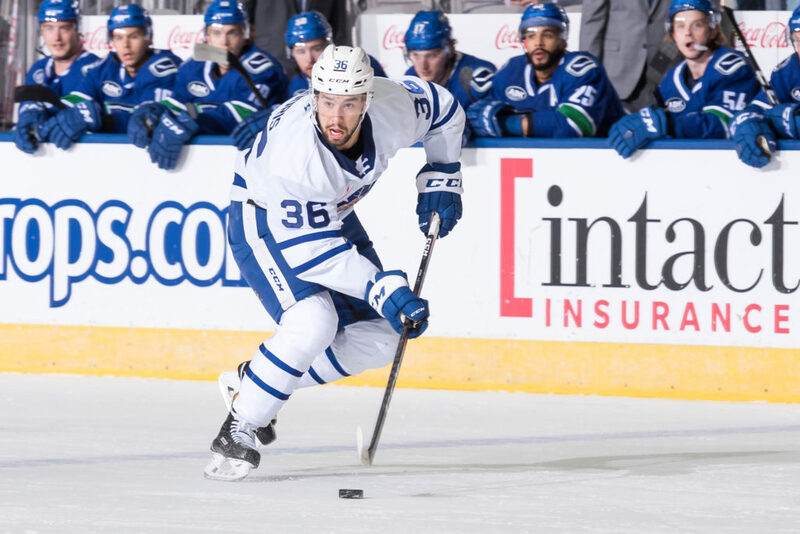 The Marlies took a 3-2 lead in the season series with Utica following a convincing 5-2 win over the Comets on March 29 at the Adirondack Bank Center. Prior to that, the Marlies doubled up on the Comets 6-3 on home ice back on January 9th. Toronto is 22-10-4-2 since January 4 and have outscored their opponents 121-106, facing 17 different teams. In 28 of 38 games, Toronto has earned a point (50). They remain in third place in the North Division with 85 points with five games remaining in the regular season. 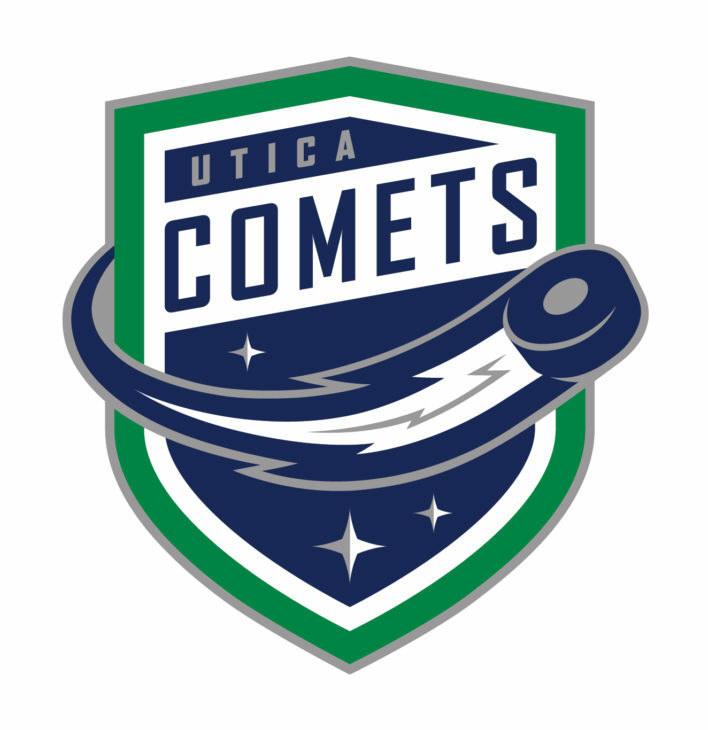 The Comets have struggled lately and are coming into tonight’s game having lost nine of their previous 10 games. They currently sit in sixth place in the North Division, eight points behind the Belleville Senators who are battling it out with Cleveland for the fourth and final playoff spot in the division. Puck drops at 7:00PM on AHLTV. Toronto Marlies. All Rights Reserved. 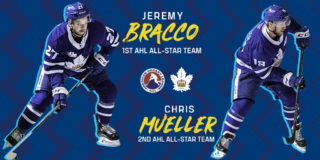 Do not duplicate in any form without permission of the Toronto Marlies.